A panel of leading experts in Asia’s health tech field sheds light on how technology is transforming the healthcare ecosystem. But given that China’s innovative healthcare companies are now able to offer everything from medical diagnoses to prescription drug delivery, teaching doctors to adopt a better bedside manner seems like a surmountable problem. 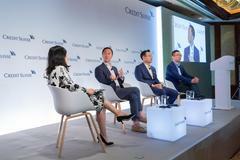 Moreover, it was clear from panellists at the 22nd Credit Suisse Asian Investment Conference that the healthcare ecosystem across Asia is being transformed by technology, even if so far, healthcare has been one of the industries most resistant to technological change. But this is beginning to change, especially in China where the combination of large unmet medical needs – which will see the country’s total healthcare costs grow to US$2.3 trillion by 2030 – and supportive government policies, have created a strong marketplace for online healthcare. Specifically in the area of internet healthcare, Credit Suisse research shows the size of China’s market reached Rmb32.5 billion in 2017. Move upstream along the supply chain and it’s clear that China’s biotech industry is also set to enter what Credit Suisse’s Serena Shao, Head of China Healthcare Research, called a “golden age”. Reforms introduced by the China Food and Drug Administration (CFDA) over the last few years have accelerated the approval time for new drugs, while the ability of pre-venue and pre-profit biotech companies to now list in Hong Kong means companies have access to new sources of revenues to fund research and development (R&D). Despite all the positives, competition in the industry is getting fiercer as international and domestic companies take advantage of the more favourable regulatory regime and the huge growth opportunity. So it was perhaps inevitable that the conversation came around to pricing. How can China’s biotech champions price their products at a level that delivers market share but also supports R&D? For Scott Liu, Co-Founder, President and CEO of Shanghai Henlius Biotech Inc., the answer is technology. “This is a technology-driven business so you have to create price leadership continuously by employing the correct technology,” he said. Liu advocated the use of innovations such as single-use bioreactors and pointed to his company’s decisions to grow its own cell cultures rather than importing them from abroad, as a way to drive down costs. By combining innovative technology with a focus on customer welfare, China’s healthcare and biotech companies have the prescription.